This is a Hand Signed Black and White 10" x 8" Publicity Photo of the late legendary British Guitarist who influenced many of the great guitarists of our era. Herbert Maurice William 'Bert' Weedon, OBE (10 May 1920 - 20 April 2012) was an English guitarist whose style of guitar playing was popular and influential during the 1950s and 1960s. 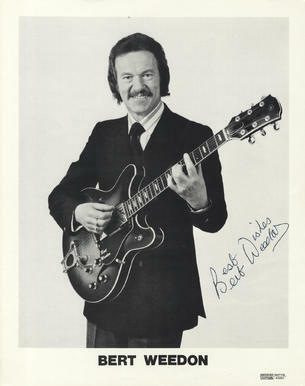 He was the first British guitarist to have a hit record in the UK Singles Chart, in 1959, and his best-selling tutorial guides, Play in a Day, were a major influence on many leading British musicians, such as Eric Clapton, Brian May, Paul McCartney, George Harrison, John Lennon, Keith Richards, Pete Townshend, Tony Iommi and Jimmy Page. He was awarded an OBE in 2001 for his "services to music".